The patient was a 7-year-old female who presented to the emergency department with a one-day history of abdominal pain and emesis. Her medical history was not provided at the time of imaging request. The patient was found to have an elevated white count. 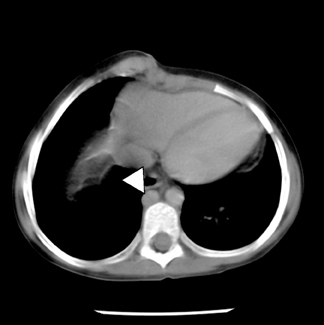 Standard chest films and computed tomography (CT) of the abdomen were requested to rule out appendicitis. 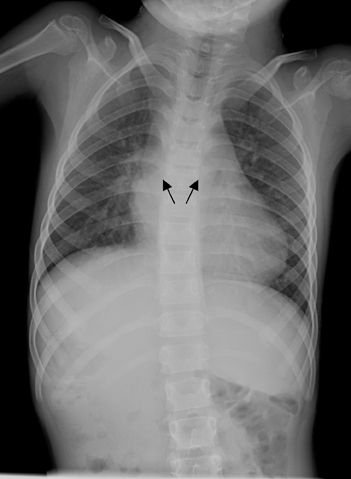 There was no evidence of acute infiltrate on front (PA) or lateral chest films, which showed mild cardiomegaly; bilateral morphologically left main stem bronchii (Figure 1). 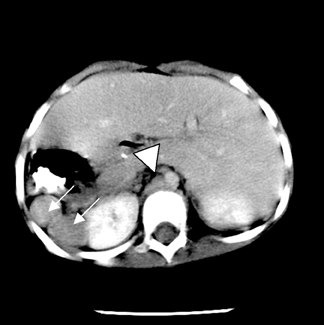 Abdominal and pelvic CT revealed polysplenia, midline liver, situs ambiguous, and interrupted inferior vena cava with azygous continuation (Figures 2 and 3). Patients with situs ambiguous traditionally have been categorized based on the number of spleens. Those with polysplenia typically are associated with hyparterial pulmonary bronchi, while asplenic patients usually have eparterial bronchi. Several overlapping anatomical abnormalities are found in both of these entities. Certain cases do not fit into this classification.2 Nonetheless, the traditional system will be utilized to characterize the findings in this case. Treatment depends on the associated abnormalities. Prognosis is generally poor in those affected with cardiac abnormalities. Improvements in antenatal diagnosis, and corrective measures such as the Fontan procedure, have significantly decreased the morbidity and mortality in patients that are candidates for this type of treatment.9 Functionality of the spleen should be assessed if splenic abnormalities are present. Patients with nonfunctional spleens or asplenia are at an increased risk for infections from encapsulated organisms, which can lead to septicemia and death. Typically, treatment consists of prophylactic antibiotics and immunizations.10 Malrotation of the intestinal tract can be surgically treated. One recent report recommends surgery only if symptoms or imaging dictate an obstruction and ischemia is rare.6 The surgeon must be aware of the individual’s specific anatomy as there can be significant variability in each case. This information could have serious implications in management and treatment for the patient. Heterotaxy syndrome is a rare disorder that commonly presents early in life secondary to associated cardiac manifestations. However, it has many possible presentations due to the variability of organ involvement. Occasionally, it can go undetected for many years, as in this case. Identification of the subtle anatomic manifestations can greatly impact the treatment of primary and secondary sequelae of this syndrome. Hernanz-Schulman M. Asplenia/Polysplenia. Available at: http://www.emedicine.com/Radio/topic58.htm. Accessed 2005. Ticho BS, Goldstein AM, Van Praagh R. Extracardiac anomalies in the heterotaxy syndromes with focus on anomalies of midline-associated structures. Am J Cardiol. 2000;85:729-734. Applegate KE, Goske MJ, Pierce G, Murphy, D. Situs revisited: Imaging of the heterotaxy syndrome. Radiographics. 1999;19:837-852. Marx MV, Van Allan R. SIR 2005 film panel case: Heterotaxia with polysplenia. J Vasc Interv Radiol. 2005;16:1055-1059. Peoples WM, Moller JH, Edwards JE. Polysplenia: A review of 146 cases. Pediatr Cardiol. 1983;4:129-137. Choi M, Borenstein SH, Hornberger L, Langer JC. 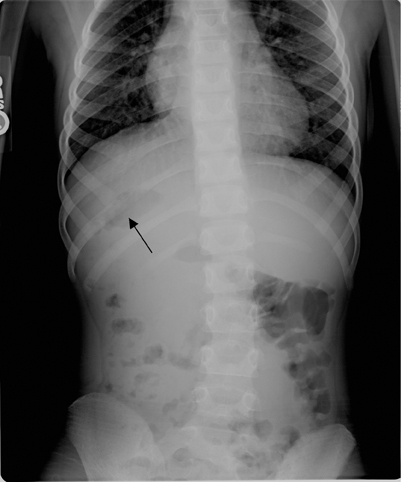 Heterotaxia syndrome: The role of screening for intestinal rotation abnormalities. Arch Dis Child. 2005;90:813-815. Belmont JW, Mohapatra B, Towbin JA, Ware SM. Molecular genetics of heterotaxy syndromes. Curr Opin Cardiol. 2004;19(3):216-220. Lin AE, Ticho BS, Houde K, et al. Heterotaxy: Associated conditions and hospital-based prevalence in newborns. Genet Med. 2000;2:157-172. Kaulitz R, Hofbeck M. Current treatment and prognosis in children with functionally univentricular hearts. Arch Dis Child. 2005;90:757-762. Long S, Pickering L, Prober C. Principles and Practice of Pediatric Infectious Diseases, 2nd Edition. Churchill Livingstone. 2003:651-652; An imprint of Elsevier. Heterotaxy syndrome with polysplenia. Appl Radiol.